When Bianca and Daniel finally got to the river and were happily splashing in the cool water, they heard Peanut's angry bark, and they saw an old woman approaching the riverbank with a basket in her hand. When the woman reached the edge of the river, she took a tiny, meowing kitten out of her basket and threw it into the river as far from shore as she could. The kitten flailed in the air, desperately crying, and then splashed into the water. 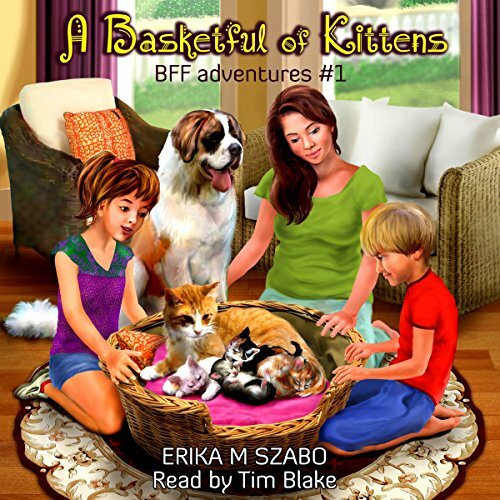 Find out what happened to the kitten and how the BFFs dealt with Mark's gang, in this first adventure of the BFF Adventures series. Erika Szabo has written another engaging story for young children. In addition to writing an enjoyable adventure, she gently educates her audience and encourages them to practice kindness to animals, thoughtfulness to their friends and bravery when faced with a bully. Tim Blake's narration is enthusiastic, bringing the listeners into the story. His pace was perhaps a little fast for younger elementary school-age children, but all in all, I enjoyed listening and would encourage any parent with young children to get this little gem and keep an eye out for further BFF adventures in this wonderful series.